This copycat recipe for Chipotle chicken is spot-on, and arguably even better than the original! You will LOVE this marinade! A copycat recipe for Chipotle’s chicken! When my husband suggested replica Chipotle burritos for lunch a couple of Saturdays ago, the chicken was an essential. While I will get either chicken or barbacoa in my burrito or tacos, my husband is a straight-up chicken burrito lover, so I knew that’s what I’d make for lunch. Another round of searching for the perfect Chipotle chicken recipe led me to this amazing marinade. When my husband smelled it, he said he wanted to just eat it by the spoonful. It’s seriously some amazing stuff! Watch How to Make Copycat Chipotle Chicken! The chicken can be marinated for just an hour, or up to one full day. Of course, the longer you let it stew in that marinade, the more the flavor is going to soak into that chicken. You can choose to cook the chicken however you’d like – baked, grilled, sautéed – but I really, really recommend that you sauté in a pan, preferably a cast iron skillet if you have one. Doing so will guarantee a wonderfully crusted exterior, which is the creme de la creme of this chicken. If you’d prefer to use chicken breasts instead of thighs, you can do that too, but I highly recommend the dark meat, as it ensures chicken that is nice and juicy, and nowhere near dry, which is a potential pitfall of using chicken breasts. So, how did this recipe fare? My husband declared it better than Chipotle, and my mom and father-in-law, neither of whom are huge fans of Mexican food, LOVED it. I’ll call that a massive success. 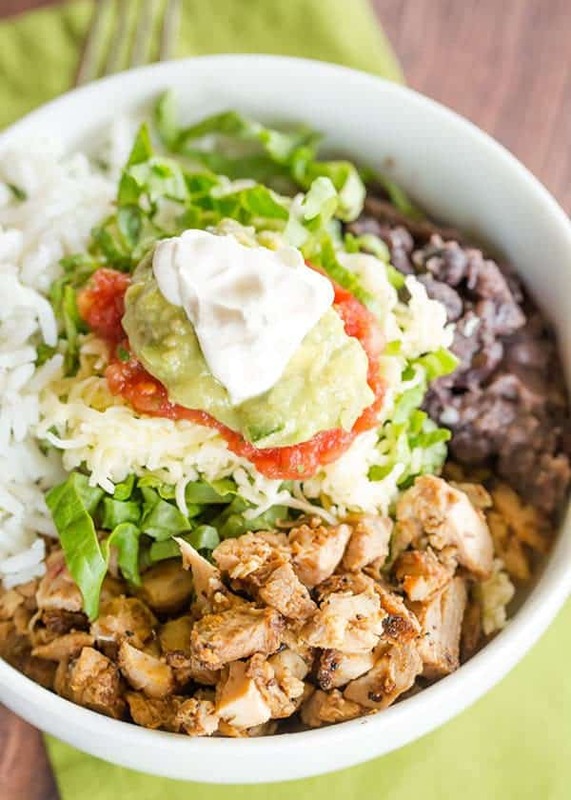 We used the chicken to make burritos, and then I used leftovers to make my own burrito bowl the next day. 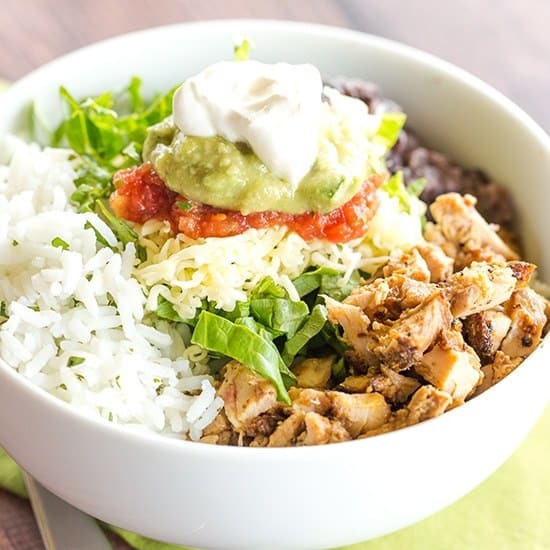 I’ve already made this Chipotle chicken again to have in the fridge for salads and wraps, and it is definitely on its way to becoming a weekly staple on our menu! 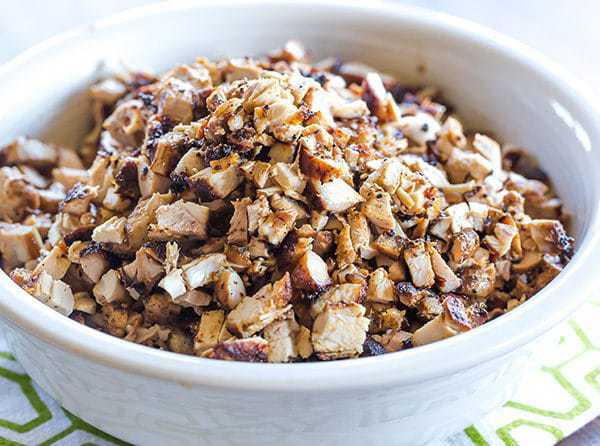 The key to this amazing copycat recipe for Chipotle chicken is the marinade, and getting a nice sear on the chicken for those crunchy bits of cooked marinade! 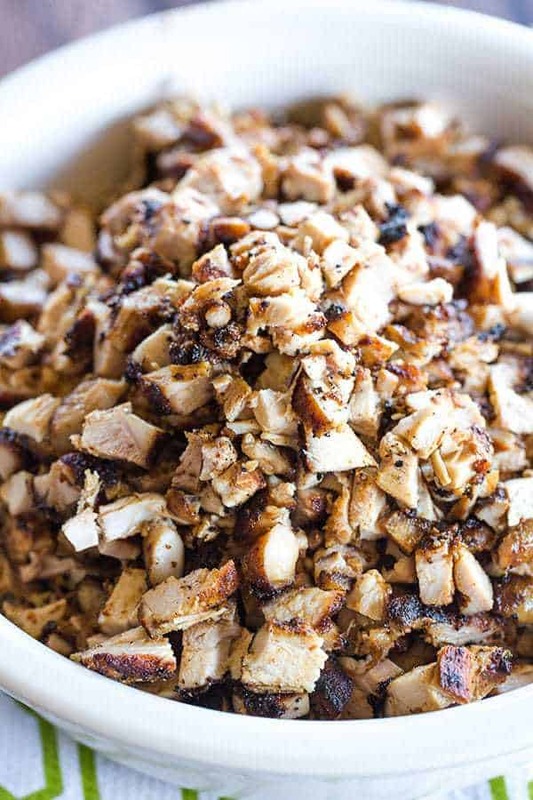 Make the Marinade: Place the onion, garlic, adobo sauce, olive oil, chile powder, cumin, oregano, salt, and pepper into a food processor or blender and process until smooth. Pour the marinade into a 1-cup measuring cup and add enough water to reach to 1 cup. Using a fork, poke holes all over the chicken thighs and place in a resealable plastic bag. Pour the marinade over, seal, and use your hands to move the marinade around so that all of the chicken is evenly coated. Refrigerate for at least 1 hour, or overnight. Cook the Chicken: Preheat a large skillet over medium heat. Add enough olive oil to coat the bottom of the pan. Add the chicken to the pan and cook, turning occasionally, until completely cooked through, 165 to 175 degrees F on an instant-read thermometer. (I recommend cooking in two batches and adding more olive oil in between, if needed). Remove the chicken to a large cutting board and allow to rest for at least 10 minutes. Slice or chop the chicken, as desired. Serve in a burrito, in a salad, or on its own! Note: You will not need all of the sauce from the can of chipotle peppers, but you can freeze the remainder (use an ice cube tray for easy measuring! ), as well as the chipotle peppers, for another recipe. Hi Denise, I guess a serving size is however much you want it to be? I think according to most packaging, a serving of meat is 3 to 4 ounces. I made this recipe exactly as written, and it was perfect!! My husband requested ‘everyday for lunch please’ so now i make a big batch on sunday and make him lunches for the week :)Thank you!! Could this be used over ground turkey for “taco meat”? I wanted to use chicken breast but currently don’t have any. Would it just be better to use normal “taco seasoning” instead of this marinade? Hi Jess, It really depends on how you prefer your taco meat… using this marinade will make a “saucy” taco meat, while a seasoning packet won’t create a “sauce”. Totally your preference! This recipe is quick and easy BUT, and this is a big one, the recipe calls for a TABLESPOON of salt. This is far too much salt. It ruined the dish and my family could barely eat it. So salty that all the other flavors (including the chicken) were drowned out. In the future I would only use a teaspoon. I don’t like super-spicy foods and this was great! But what would you add if you wanted a little more heat? Hi Karen, So glad you enjoyed it! I would add a bit of cayenne if you’d like more heat, or you could chop up one of the chipotle peppers. I made this tonight and it was Amazing!!!! Thank you!!!! I will be making this regularly!!! Absolutely delicious! The whole family loved this chicken! Followed the instructions to a tee and it turned out horribly. I used every ingredient, marinated overnight and bought excellent chicken thighs to no avail. I’ve been saving this recipe for 9 months, hoping to use it and was sorely disappointed. It didn’t only turn out bad, it couldn’t be fixed. I had to throw it away. I’m definitely disappointed. Hi Alyssa, I’m sorry that this didn’t work out for you. You didn’t mention what exactly what went wrong, though. I’d love to help you troubleshoot since all of the other reviews on this recipe were five stars! The first time it took me a little while to get all of this ingredients right and put everything together. But now that I’ve got it down it doesn’t take long and it is awesome. It really tastes like Chipotle. I tested 5 different Chipotle with Adobe sauce and the best brand was definitely Costena. You only need 2 tablespoons so you have quite a bit left over. Instead of freezing it I used it to make salsa, adding jalapenos, onions and cilantro. Then I blended it in a food processor and canned it. I’m definitely making this recipe every time I have a craving for Chipotle. Made this chicken last night and it was amazing!!!!! I’m so glad I came across this recipe. I will never use another one for taco Tuesday!!!! Made rice bowls and burritos with cilantro lime rice, black beans and all the fixings and it was delish!!!! And I forgot to mention we grilled it and it was outstanding!! Can you buy adobo sauce at a regular grocery store? Hi Mare, Yes, I find the jar in the Mexican/Hispanic section of the store and it’s usually packaged as chipotle peppers in adobo sauce. Awesome recipe! It was everything you described and your instructions were incredibly helpful. My most enjoyable braising, ever! My family all said it was better than chipotle. Thank you! Great recipe. Out the box it’s kinda salty so I use a little less. It’s fantastic, and I actually can’t go to Chipotle anymore, because I don’t really like dark meat and I can use breast on this. Side note, I just marinated beef in this overnight, then put it in the slow cooker and drained the marinade into that and filled the rest with water. It tastes a lot like the barbacoa. Hi Alanor, So awesome to hear how much you enjoyed this, and love the tip on the slow cooker barbacoa, I will definitely have to try that! Hi Andrea, I’ve never grilled them, but I’m sure they would be delicious! Made this last week and it was so wonderful! Thank you! Do you think it would be possible to make a double batch of the marinade and then freeze half of it for a later time? Hi Lauren, Yes, absolutely! I do that all of the time, actually! Hi Bridgette, Thank you so much for taking the time to write a review; I’m so incredibly thrilled that you and your family enjoyed the recipes so much! Where do you find adobe sauce in the grocery store. I have never heard of it. I found mine over next to the salsas and canned peppers in the taco section of my store. It all depends on how your store is set up. It’s possibly in the International section or could also be near the pickles and Jalepenos in jars as well, again just depends on the store. Hope that helps! Hi Gretchen, I find it in the International aisle of the grocery store, in the Hispanic section. This chicken is amazing! I made the marinade in just a few minutes and let the chicken sit for about 5 hours. 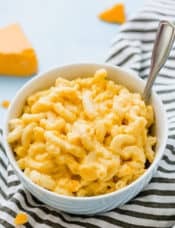 I followed the recipe exactly as listed and I couldn’t be happier, when I cook it’s usually pretty simple and this was great it was simple and then out perfect. Made this tonight. Good flavor and not bad, but definitely not the caliber of Chipotle chicken. My quest for at home Chipotle chicken continues. 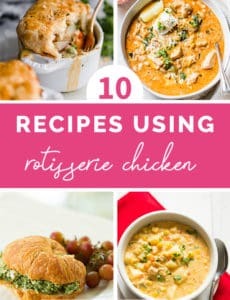 If your husband thought it was /better/ than chipotle, and your parents, neither of whom like chipotle, like the chicken … then how can this possibly be called a copycat recipe? It sounds like you made a version of your own..
Made this last week…it was phenomenal! Tasted just like chipotle! Whole family loved it! 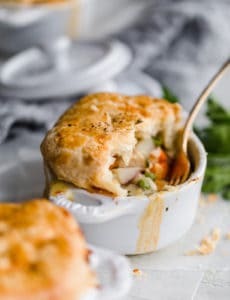 I did this recipe and it was amazing! I do have a question: would it work to cook the chicken in a slow cooker? I know the crusty flavor bits wouldn’t be there; trying to cut down on time actually spent in the kitchen. Yeah you would definitely miss the crusty exterior, but it would cook it for sure. Wow! If anyone has any reservations about this recipe tasting like the real thing. Have no fear. It does. I made this for my daughter and her boyfriend last night. My daughter eats at Chipotle almost everyday. I’m not exaggerating either. She goes there so much that they even give it to her free sometimes or give her buy one get one free cards. My point is, if there is someone who might be an authority on how it should taste, she might be it. In fact she said it tasted even better. I also made the Chipotle Cilantro Lime Rice recipe and she said that tasted spot on to the real thing. I bought chicken thighs with the skin and bone still in and just cut it out. It was 3.41 lbs. and by the time i removed the bone and skin I was afraid I might be a little lite on the meat so I added a couple of small chicken breasts. Turned out freakin’ awesome. My daughter has a problem with gluten, so it was great to have something so good that doesn’t bother her stomach. I also bought seasoned black beans (I like), Chopotle pinto beans (her boyfriend likes), monterey jack, sour cream, Chipotle salsa and lettuce to add to it. I did find that with that much chicken that I’ll need to double the rice recipe. It didn’t make near enough. 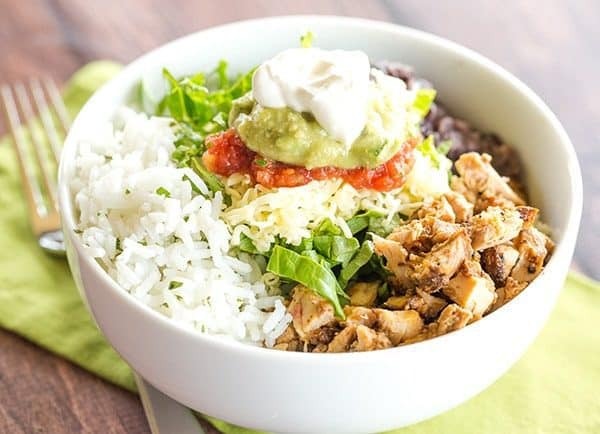 When making the Chipotle chicken, how would I make for 70 people? Could I put on the grill for a few minutes to brown and than bake in oven? If I bake in oven should I cover with foil? Temp? Thanks for any input! Hi Linda, You would just to increase all of the ingredients accordingly. You can grill the chicken totally, you wouldn’t need to transfer it. Or, you could bake it in the oven, as well. Any of those cooking methods would work. This is by far the best chicken recipe I have ever made!! 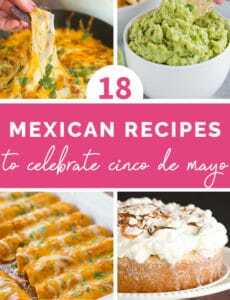 It is super easy to prepare and super easy to eat. My body builder boyfriend loves it so much I have to make it for him again (2 times in one week!!!) Thank you for this gem, I will now browse the rest of your recipes! My husband is a serious Chipotle addict….as in once a week at least for lunch. I decided to make this for dinner with his family the other night. HUGE hit. Everyone loved it and it is SPOT ON Chipotle flavors. I was a little concerned about heat level with the adobo sauce, but it wasn’t too spicy at all. In fact, three kids wolfed down the chicken (ages 5, 5 and 2.5). I couldn’t find ancho chili powder, so I subbed regular, and I used pounded chicken breasts (just to even thickness). Man, it was SO GOOD. And this marinade was the perfect amount for 6 chicken breasts (3 lbs. total). I’ve been eating the leftovers for now 3 days and it’s just as good as the first day. I even made your version of Chipotle’s Cilantro Lime Rice. Another winner! This is going into my weekly rotation too…maybe I can keep the hubby home once a week for lunch now! Hi Diane, Thanks so much for the comment, I’m thrilled your whole family enjoyed this! Right now I’ve chosen not to include nutritional information, primarily because there can be quite a bit of variance depending on products used. If that changes in the future, I’ll be sure to let everyone know!